One of my biggest weaknesses is without a doubt chinese food....but lets be honest, if we indulged those habits from your local chinese take-away we'd never reach our goals! I came across this recipe through a friend who had tried it, and knew it was RIGHT up my alley. An EASY, asian inspired crockpot recipe! Does it get much better than that? 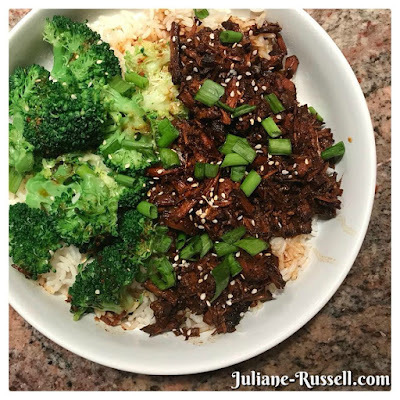 I put my own spin on it, and to make it low carb, you can serve with cauliflower rice instead of jasmine rice. Tonight I was low on carbs so I ended up switching cauliflower rice for regular instead. You an also use this shredded beef in a number of different ways!! Perhaps Asian inspired hoisin beef taco's or on top of a crunchy cabbage salad. Perhaps served with some stir fried rice or garlic noodles! Combine the soy sauce, brown sugar, and 1/2 cup water in a bowl and stir until the brown sugar is dissolved. Add the garlic, ginger, and toasted sesame oil to the soy sauce mixture. Set the cooking liquid aside. Once the beef is tender, it's time to thicken the sauce. Dissolve the cornstarch in 2 tablespoons of water, then pour it into the pot with the beef and cooking liquid. Stir to combine, then allow it to come back up to a simmer, at which point the sauce will thicken just slightly. Turn the heat off and garnish with the sesame seeds and remaining green onions (sliced). Serve over a bed of rice or as part of your favorite meal.